With a distinctive mix of campus-based, distance and international teaching, and a proud 80-year tradition of academic excellence, Massey University is committed to innovation. The university boasts nearly 18,000 students enrolled on three main campuses in New Zealand, and approximately 17,000 national and worldwide distance learning (extramural) students. Its forward-thinking spirit, research-led teaching, and cutting-edge discoveries make Massey New Zealand’s defining university. Tiriti-led, Massey is upholding Tiriti o Waitangi principles through the University’s practice. 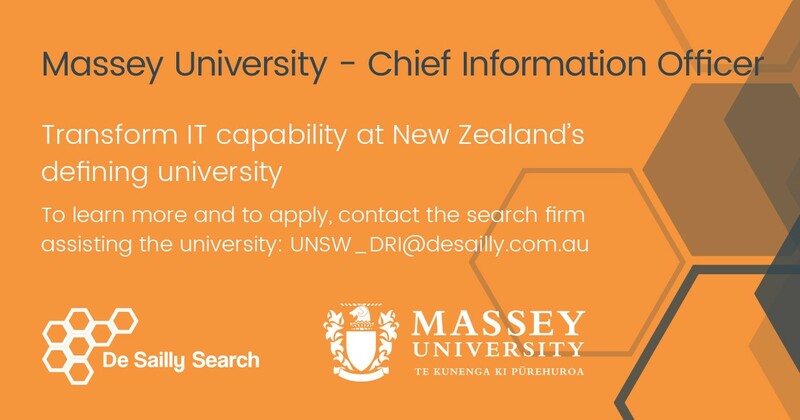 The Chief Information Officer (CIO) leads an enthusiastic team of 170 FTE staff to deliver IT capabilities at Massey, improving experiences for both students and staff. The CIO is responsible for the information, analytical, and data integrity services for all IT functions of the University. The CIO enables the business to achieve its strategies by providing a broad range of information and digital solutions and services. designing an open, agile, student and business-engaged service to create efficiencies and new value from digital initiative. The next CIO will enable the delivery of robust systems to support the success of staff and students by applying technology to core business problems and opportunities. Ideally with experience in higher education, or in a similar complex and scaled environment, the CIO be able to run a complex, scaled and multi-site IT operation. The CIO will be agile and able to lead transformative change in cultural orientation. A business strategist, the CIO will create a digital vision and initiate IT change and transformation, taking advantage of digital opportunities to innovate business models and enable the digitalisation Massey’s business. The CIO will be a capability developer, instrumental in building an inclusive and customer centric culture and mindset in the IT service and creating a greater sense of shared purpose, connectedness and cohesion among the staff. Supporting letter addressing the person specifications and aligning them with your capabilities. We also ask that you indicate your preferred commencement date. The names of at least three referees, stating your relationship with each referee. You must provide contact details for each referee, including their email address and telephone number. We will seek your permission prior to contacting your nominated referees. Qualifications: Master’s degree in Computer Science, Information Systems, Business Administration or related field, or equivalent work experience. Relevant line management experience on the ‘business side’ would be desirable. Fifteen or more years of experience in IT and business/industry. Five to seven years of leadership and management responsibilities. Proven experience or demonstrated capability in leading IT transformational initiatives in complex and dynamic environments by taking advantage of digital opportunities to innovate business models and enable the digitalisation of the business. Preferably five or more years of experience in related, industry-leading, large, cross-functional teams and/or enterprise wide programs, influencing senior-level management and key stakeholders effectively across the organisation and within complex contexts. Demonstrated experience in IT strategic planning, organisation design and development. Preferably five or more years of experience in informationally intensive industries or digitally advanced enterprises. Capabilities (Skills, Behaviours, Experience): are listed in the candidate booklet. A candidate booklet is available which includes the person specifications.